A man adjusts a Chinese flag before Chinese Foreign Minister Yang Jiechi and U.S. Secretary of State Hillary Clinton’s press conference at the Great Hall of the People, Beijing, September 5, 2012.
Who will be the winner of the upcoming Trump-Xi summit? My answer: That’s a dangerous—and wrongheaded—question to focus on. Yes, we want the U.S. to win, but the U.S.-China relationship must be played and judged as a long game. The present situation is one of almost unprecedented risk in the relationship. The risks derive in part from the fact that both President Trump and President Xi are strong personalities, but reveal their strength through radically different styles. 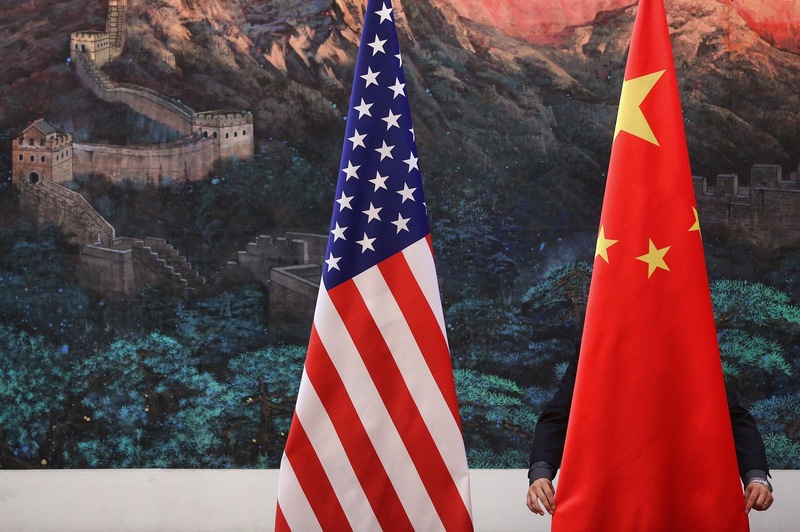 The two presidents come to the summit with very different experience in U.S.-China diplomacy, and on the U.S. side very incomplete policy development and staffing. But both men need something similar from the summit: a public recognition that they represented their countries’ interests with strength. And both men need to avoid a public perception that they were the “loser.” If each gets what he needs in this respect, they will have room to maneuver and compromise in the extensive diplomacy that should follow, and that will benefit both countries. The risks also extend to the many extremely difficult substantive issues. Given how early this is in the Trump presidency, however, there should be two important but limited goals for the summit in addressing these issues, neither of which will or should produce clear winners or losers. First, we should hope that the summit yields a decent atmosphere for the hard work of detailed diplomacy that lies ahead in tackling urgent problems. Second, the two presidents should clearly convey their main priorities and concerns, and do their best to understand the other’s priorities and concerns. This is not a summit to make deals, but to figure out what kinds of deals need to be made and to commit to trying to make them—to convey and understand each other’s priorities, interests, and concerns, to make clear what is urgent and essential and at the same time establish a “to be continued” atmosphere. The upcoming meeting is the start of a negotiating process. We’ll all get impressions of how things went, but it’s very hard to judge who’s the winner or loser at the very beginning of a negotiation process. The new administration’s many fumbles thus far and its seeming lack of well-developed goals and strategies for our China policy make it easy to draw quick conclusions. But it’s results that matter, and we need to see what the diplomatic process actually produces on the issues of greatest importance. Two major concerns seem to rank above all others for President Trump at present. First, the U.S.-China investment and trade relationship is very imbalanced for the U.S. We are right to insist on more reciprocity. For example, the U.S. market is wide open to Chinese investment; the Chinese market far more closed. The U.S.-China trade relationship has lowered U.S. consumer prices, but has displaced many workers. China needs to do more to buy our job-creating exports and make more job-creating investments here. This is a top priority, but we already know not to expect concrete trade deals from this very early summit. Last Friday, the Trump administration signaled that concrete negotiations about trade would almost certainly be delayed until after a 90-day “comprehensive review” of U.S. trade deficits, including the one with China. Second, after many years of unsuccessful attempts to diminish the threat posed by the regime in North Korea, we have nearly reached a long-feared geopolitical crisis point. China’s neighbor and ally is on the verge of dangerous technological breakthroughs that will allow it to target the continental United States with nuclear weapons, not to mention to inflict nuclear terror on our allies South Korea and Japan. No U.S. president can fail to address this national security threat firmly and quickly. China can do much more to sanction North Korea economically to push it at least to freeze its nuclear program. But rather than begin the discussion by telling President Xi what China must do, a better negotiating technique at this point would be to explain our urgent national security concerns and ask President Xi to explain what his own concerns are. China’s true concerns are that tightening the economic noose on North Korea will lead to the collapse of the regime and the loss of a protective buffer state on its border. If the Chinese side is candid about its real concerns regarding North Korea, then there is room for negotiators to explore whether there are ways to address both countries’ concerns and thus address the North Korea problem with the cooperative approach that would be most effective. Overall, China’s priorities are Taiwan, its own uncertain economy, the regime security of the Chinese Communist Party, and sovereignty disputes in its contentious neighborhood. To sustain a positive relationship with China, the United States will need to continue our “one China” policy (which Trump briefly suggested was in play), work out economic deals that recognize China’s legitimate worries, and undertake the very difficult exploration of how our two countries can co-exist as huge Asia-Pacific military powers, with the U.S. having important alliances and major interests in Asia. The nationalistic impulses driving the major substantive concerns on both sides add a potentially explosive mix to what, objectively viewed, would be a very complex relationship simply in terms of balancing interests. In this difficult and dangerous situation, the best we can hope for is a commitment to make sustained efforts to find the maximum common ground and manage differences. We should not expect a winner or loser at this week’s summit—and we should not want a winner or loser.